Customizing your shotgun for ultimate performance afield. Does your shotgun really fit perfectly, or are you just "adapting" to it? Of course, many of you have more than one GUN for waterfowling. If that's true, and unless all of them are the same make and model, your various duck and goose guns probably don't have the same stock dimensions. So how can you shoot them so well? Testing so many different shotguns over the years, you can bet I've shot a passel of them with differing stock dimensions. So, I make do for the test guns at least. You probably make do with your waterfowl guns, too. Bob Brister, the dean of shotgun writers, wrote in his classic book, "Shotgunning - The Art And The Science" about being custom fit by two prominent English gun fitters. One was Norman Clarke of Holland & Holland, while the other was Harry Lawrence of Purdey. Of course, these are two of the most famous names in English Best Shotguns, and the gun fitters were among the most prominent in their field at the time. Bob Brister probably shot more test guns than I have, so you can bet that he, too, like me, had to adapt his body to all those different shotgun stocks. This showed up in the individual gun fittings he had with both these noted Englishmen. How? Both fittings were a relatively long and difficult process for these experts because Bob was such an accomplished shotgunner already, and he kept adapting to the various Try-Gun stock dimensions these fitters tried--so that so many of Bob's shots at the X on the pattern plate were nearly exactly where they were supposed to be--no matter how the Try-Gun was rigged. However, both fitters eventually got Bob Brister fit up perfectly. Interestingly, they both came up with the same stock dimensions for this noted shotgun authority. But even though Bob could adapt well to a rather ill-fitting shotgun, he was first to affirm that he unquestionably shot guns even better when the stocks were made to these custom dimensions. I know I do better with my custom fit guns. If you have not been professionally fit to a shotgun, you should, and, as well as you shoot now, you'll shoot better with a stock that has been perfectly custom fit to you. Now that we are in the off season, wouldn't it be a good time to do this? Many times I've heard shooters excitedly comment after picking up someone else's shotgun or perhaps one in a gun shop, "Boy do I like this one. It fits me perfectly." Such a gun may appear to fit well, but it doesn't make a lot of sense to simply assume that it does fit--and never try it on the pattern plate or pattern paper. Please understand that I'm not talking about how a gun will pattern. I'm talking about where the center of the pattern hits when you throw the shotgun up and just shoot it. If you're an experienced shooter, don't take too much time, otherwise you will be "adapting" to the gun. After practicing your gun mount over and over at home and getting a very consistent gun mount, go to the range, put up a big sheet of paper at 16 to 20 yards, mark a big X in the middle of the paper, go back and just shoot the gun with your normal gun mount; but with no delay and no aiming. It's best to shoot one piece of pattern paper two or three times to get an average of where the center of the pattern is hitting. Of course, this procedure is without the benefit of a professional gun fitter, so take that into consideration. So if the pattern in your waterfowl gun shoots two inches left and two inches high, what do you do about it? Or maybe the distance away from your X marked on the paper is even greater. If you're off the mark two inches at 20 yards, that translates to four inches at 40 yards...maybe more. You do have some options on the how-to of getting your personal waterfowl gun to shoot exactly where you want. Stock bending is one possibility, assuming your waterfowl shotgun has a wood stock. 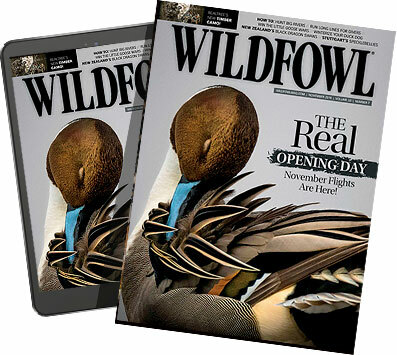 These days, many of our wildfowl gun stocks are not wood, but composite--black or camo. However, with many of these latter shotgun types, the manufacturers are supplying a set of spacers that fit between the front of the stock and the rear of the receiver. But I wonder how many wildfowlers are taking advantage of these spacers. Not a very high percentage is my guess. In almost every shooting scenario, one particular set of these spacers could have you shooting exactly where you want. The instructions that come with such a gun explain how to get the gun shooting where you are looking. If you don't know someone who can bend your walnut stock in hot oil, you can always sand some wood off the side of the comb (assuming your gun is shooting to the left). Some consider this a pretty radical move, but it isn't. Take a bit of wood off at a time, and keep going back to the pattern paper. Don't start refinishing the stock until the gun is shooting perfectly for you. At that time, just follow the directions with Tru-Oil and you will achieve a very satisfactory stock refinish where you have sanded. If the gun is shooting too high, instead of stock bending, you can sand away at a bit of the walnut at the top of the comb. If the gun is shooting too low, you can add one of several different versions of a Meadow Land's Pad. Another alternative here is to add Moleskin (easily found at your local drug store) to the top of the pad, or to the left side of the stock (assuming a right-handed shooter) if the gun's pattern is hitting too far to the right. Moleskin comes in various thicknesses, so just add a little at a time, each time going back to the pattern paper with the X until you have just the right amount of Moleskin. Another stock fit problem can be length of pull. Instructors generally concede that most of us could shoot better if we shot longer stocks, and I tend to agree with that. However, we wildfowlers tend to hunt in some doggone cold weather where we have to don quite a bit of clothing if we're going to stay out very long. In dove season, we may only wear a T-Shirt, while in early teal season we may have about the same amount of material at our shoulders. As the season wears on we tend toward heavier and heavier clothing, which can change the length of pull we need. e early seasons, we can add a different, longer recoil pad. Maybe we'd need two of those of differing lengths depending on how much clothing we change from one end of the season to the other. Again, I know that you can "adapt" and shoot your gun reasonably well despite many mitigating factors. I think we owe it to ourselves and to the wildfowl we pursue to shoot the best we're capable of shooting. Despite all the personal gun fitting we can accomplish on our own, many other gun fitting aspects can come into play here. So despite all that you and I can do personally in this regard, remember that a professional gun fitter can do more. Check the sidebar for more information on what I've covered here. Nick Sisley can be contacted at nicksisley@hotmail.com. For personal gun fitting as well as stock bending try these contacts. 1. Montana Custom Gunstocks — bart@mtlongguns.com or Bob James at 406-250-9292. 2. Cole Gunsmithing — Rich Cole — rc@colegun.com — (800) 650-2653. 3. Chris Batha Gunsmith Service — chrisbatha@aol.com — (866) 254-2406.